Our morning started with a beautiful interreligious prayer that is normally organized with the centre. The prayer encompasses everyone with their different religious belief and it manifests the true spirit of interreligious dialogues. After the prayer and introductions, we were dispatched to different groups. First group was to help in the kitchen, preparing breakfast, setting the table and cleaning the utensils. Second group went with the nurses for outreach with a mobile clinic to other centre to distribute medicine and check on the status of the clients. During our stay there, we witnessed volunteers from other religions who came to assist in the kitchen. We were glad to learn that, the menu of that day which comprised of breakfast (black tea, two slices of bread and a piece of cake) and lunch (rice and meat-sauce) was provided by the Muslim community. Other Christian communities also have their day to give donations towards the running of the centre as well as different Organizations. Government plays a special role as well. Individual people and concerned citizens are always welcomed to contribute in kindly, monetary or any other form. Leaders from across other faith communities (Hindus, Jews, Muslims and Christians of various denominations) are the patrons of the Denis Hurley’s centre. The centre is open to all people; all colours, all nationalities, all religions, all ages and all genders. It does not discriminate on any basis. Hunger has no boundaries, it neither discriminates nor ignores and this is the reason why everyone is welcome and catered for. The centre assists almost three hundred people per day. What Activities are done there? There are a number of activities performed by the centre. Soup kitchen is the main activity; it takes place every day from Monday to Sunday, twice a day morning and afternoon. The centre provides also education to children of migrants and other interested pupils. They teach IsiZulu, English and other special courses that enable the pupil to integrate well into the reality of South Africa. The visitors to the centre also get free education on environmental issues and the care of humanity. They have mobile and immobile clinic. They provide bathrooms for free, hot shower and a free dry-cleaning service. The Oikos group has been visiting Denis Hurley’s Centre since its beginning, as a matter of fact; most of us were not visiting for the first time. Nevertheless, every time we visit we learn new things as it was confessed by majority. We all agreed that, it was a transforming experience under the guidance of divine providence. We also learnt that not only religious can serve God, even other people can do wonderful works; we serve the same God we only come to Him differently. After spending the whole day at the centre, we were given a special mission; the mission to protect the environment, the mission to spearhead the struggle to conserve nature and to take good care of it. It is only when nature is at peace that we can claim to have peace ourselves. We were challenged and asked to take the challenge to our various communities and wherever we shall go. How at the personal level are you taking care of our common home? How is your community taking care of environment? What are the simple ways that we can implement at personal and community level to promote and care for our common home? We returned well to our various communities with the promise to visit again and to carry our hearts the experience we had at the centre. 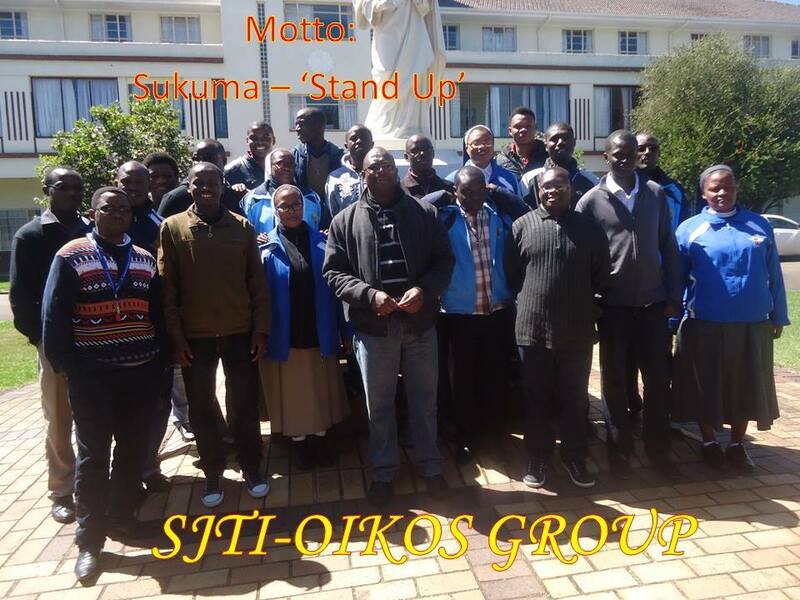 The following brothers and Sister were elected as the 2017 SJTI-OIKOS executive following our Constitutions; SECTION FIVE (a) and accepted through the help of God, to lead the group in collaboration with the Student Forum and the whole Institute for the Justice and Peace of the humanity and creation! This is the official Name of the club as documented in our constitutions and we bear the motto ‘Sukuma’ a word borrowed from Zulu language for ‘Stand up’, a call to be a voice and light in matters where justice, peace, integrity and true love seem compromised among our brothers and sisters. Currently we have Fr. Gideon Sibanda as our patron and source of advice, accompanying us in actualizing our dreams. The group pursues its mission in collaboration with the St. Joseph Theological Institute – Cedara (where we are rooted), the Student Forum, other student bodies and the larger Church. It is based on the principles of democracy, non-racism, non-sexism and non-profitability fostering the common good of all within and outside the Institute. Among the many objectives of the group as stipulated in our constitutions and as we have been engaged in this year is to be involved in justice and peace activities in group discussions and actions, be in the forerun in humanitarian issues, initiate projects to promote human life and stand with our sisters and brothers in times of insecurity as a voice to the voiceless. We managed to identify some needy families in Jika Joe, Site 11 and Afghanistan slums at the periphery of the Pietermaritzburg town and issued some clothing (for both adults and children), beddings and dishes which we had received from different communities forming the bigger SJTI community. On the same note, we managed to hold talks with those families and share in their life situation commenting them into our prayers as they pray for us. In mid-April, we were privileged to be involved in a ‘Silent Protest’ against drugs and addiction in Woodlands (PMB) organized by St. Martin de Porres Parish among other Churches in that area under the theme, ‘SET MY PEOPLE FREE’ (Exodus 5:1) where ourselves as Oikos members were armed with placards too prepared by the Churches under the themes; ‘Say No to Drugs’, ‘Set me free’, Users are losers’, Hugs Not Drugs’, Save the Youth from Drugs’ etc. This was to sensitize the society on the need to take as its responsibility freeing mostly the young people from different addictions and not let it remain a family issue. There was also a call for the parents and guardians to come out of the denial that their sons and daughters are not imprisoned in drugs and it can only be fought and completely defeated not from individual’s battle but a communal one. At the end of the year, we managed to have our last out-reach at Denis Hurley Centre in Durban where we went to ‘learn by serving’.We celebrated the memorial of St. Vincent de Paul in a special way by visiting this Centre where following the example of thisPatron Saint of all works of charity especially for the poor, the SJTI-Oikos spend the whole morning volunteering in learning through cleaning, preparing lunch and serving the homeless and the refugees who are beneficiaries of the Nkosinathi Project there. In this Centre we were fascinated by the different activities run and it was a great opportunity to visit the various departments in DHC such as the clinic, the tailoring and embroidery, the HIV department, Refugees (where they also give English basics to their children) and the Homeless. As St. Mother Teresa said; ‘If you can’t feed a nation, feed one person’, it was a heart touching encounter… educative and inspiring. It leaves a person with more questions than answers… Reflecting on the meaning of life and the way s/he lives it and may be making her/him more concerned on “REACHING OUT FOR THE OTHER”, the neighbor! So far, we have one of our dreams still in the pot which we have to actualize too as a Club with the help of the Institute. That is, availing text books to young stars especially from Grade six in order to equip them for their Matrix. This is after some investigation among some pupils in several slums (Cite 11, Afghanistan, happy Valley, Shiya-bazali) within our metropolitan. I think that each one of us can recall a warm-heart that brightened our day when we were pupils/students in O-levels as far as our studies are concerned. Once the project is ready to actualize, we shall reach to each member of SJTI Community and beyond to brighten a youngster in this line. More updates to be given as the field work goes on about the project. 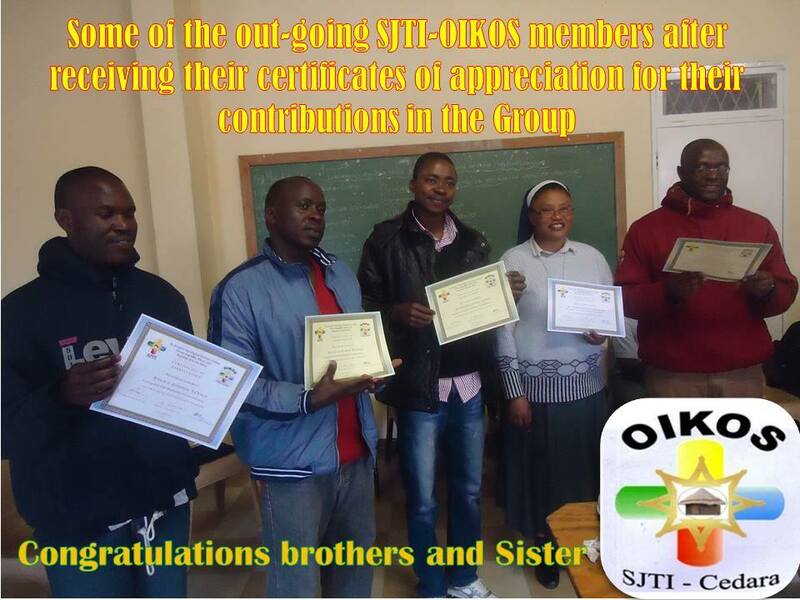 Lastly, we appreciate the Institute at large for allowing us to function under their name (SJTI-Oikos Group) and premises, our different communities and individuals for moral, material, financial and personnel support. Your prayers have also been a source of force to keep us propelling higher and higher zealously. May the Lord bless each one of us abundantly and grant our heart’s desires in our missions.